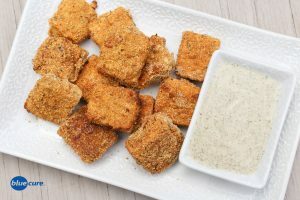 Swap out the chicken-nuggets with these tofu nuggets for a Meatless Monday or plant-based meal. The tofu makes these nuggets packed with protein. The cornmeal coating makes the tofu crispy and savory. Toss them onto your salad, serve them as an appetizer, or pair them with mashed potatoes and roasted veggies for a healthy spin on classic, American meals. Press the water out of the tofu. Slice into 14-16 pieces. Lightly heat on a skillet. In a small bowl, combine the ground flax with 6 Tablespoons of water. Set aside. *If the flax mixture becomes too thick later, add an additional tablespoon of water. In a dry bowl, combine the cornmeal and spices. Using a fork, dip the tofu slices into the flax mixture and then dip into the cornmeal mixture to coat. After the tofu is coated, place it on the pan and continue until all the tofu slices are coated. Using a basting brush, coat the tofu nuggets with lemon juice. Place the tofu into the oven and bake for 15 minutes, then turn the tofu nuggets and bake for another 15 minutes. Serve with dilly-ranch dressing or marinara sauce and a side of raw or roasted veggies.